I got chills, they're multiplying- What I wore | S J M W E L L - Fashion, Beauty & Lifestyle blog. I thought the title would be quite appropriate seeing as anytime I see disco pant's I instantly think of Sandy and the rather fun ending scene in Grease. 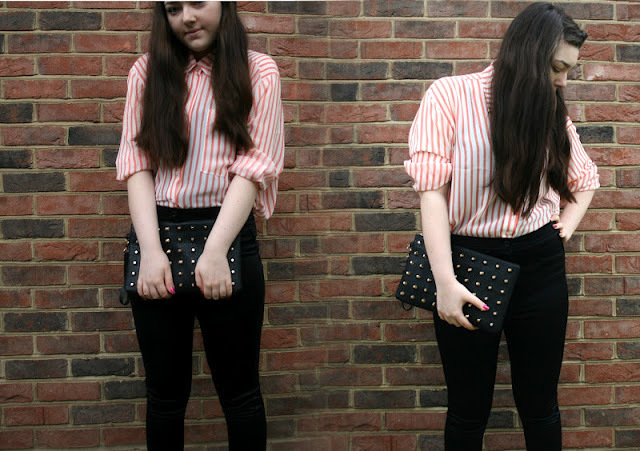 I did a little post on these 'trousers' here the other day and said I would do an outfit post so here it is! They're so versatile I think they will be paired with most of my wardrobe. This is my new favourite bag, I love this clutch soo much. It has stud's, that's all I need to say. Anything with stud's I love. It look's so much more expensive then it really was which is always a bonus, right? First time I've got an outfit post wearing trouser's too, woo! Oooh I love that clutch! I've been looking for a black studded clutch bag for ages but I've never found one I like - LOVE yours! the clutch is amazing :) and your outfit too :)!